REV. FR. 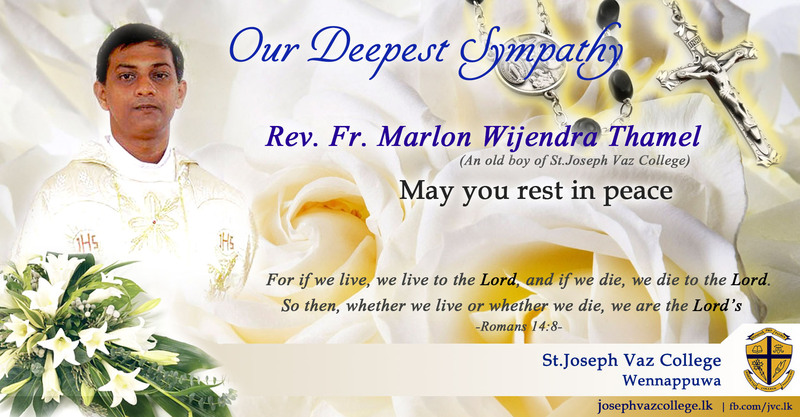 MARLON WIJENDRA THAMEL, an old boy of St. Joseph Vaz College - Assistant Parish Priest, Puttalam, expired. The remains will lie at St. Joseph’s Church, Wennappuwa till 9.00 a.m. on Friday and from 10.00 a.m. onwards at St. Mary’s Church, Marawila. Funeral Mass at St. Mary’s Church, Marawila on 23rd October at 3.00 p.m. The Burial will take place at Marawila Cemetery.